We love to play outdoors whenever we can, so it’s always a bonus when we can incorporate some of our learning goals into outdoor play. 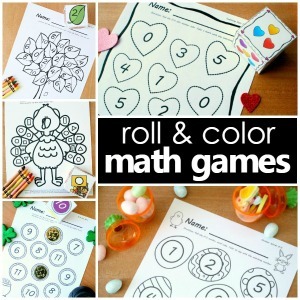 This simple rhyming game is a fun way to help toddlers and preschoolers practice generating rhyming words. To set up the game you’ll need to gather some small toys or objects from around the house. Try to grab items that are easy to rhyme with. We chose a bug, train, cake, keys, ball, pot, block, and car. Note: You may want to avoid items that could lead to kids generating inappropriate words. For example, I usually don’t choose a truck or a stick. I’ve learned that the hard way in my kindergarten classroom. And along those lines, you may wonder what to do if kids do say an inappropriate word while rhyming. I typically don’t say anything. Most often they are unaware of what they’ve said, and they continue on creating more rhyming words. If we react and make a big deal about the word, then it may pique their curiosity and encourage them to use the word more often. If however, the child knows the words is inappropriate and says it for that reason, then I would handle it differently. 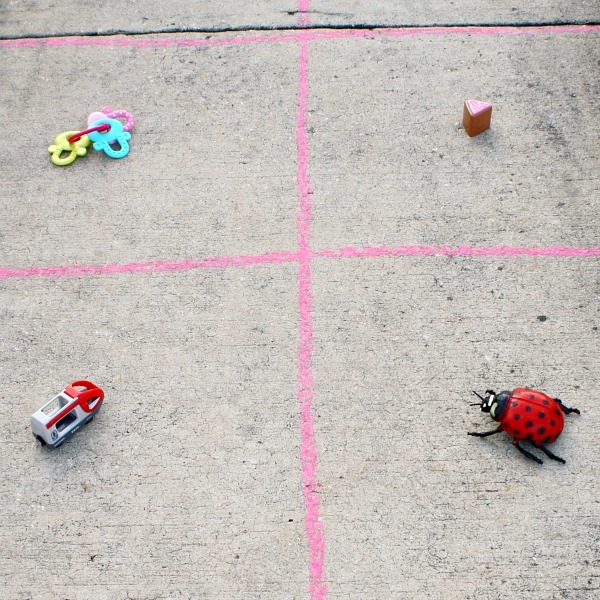 Now that we’ve got that sorted out, grab some chalk and draw a grid. We made a simple set of squares on our sidewalk. Then we placed our objects into the squares. Next you’ll need something to toss. You can grab a bean bag or toy ring. We grabbed the first thing handy, a small rock from our flowerbed. 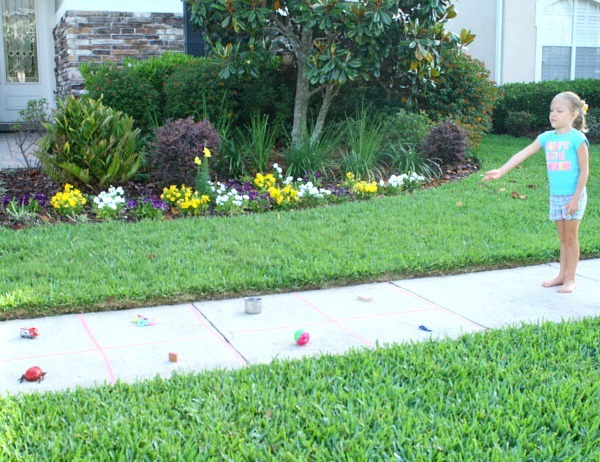 To play have kids stand back (any distance you choose, shorter if you are tossing a rock) and toss the object. Kids generate a word or words that rhyme with the object in the square where the rock lands. Accept any rhyming words, real or nonsense, and challenge them to think of new ones each time they land on the same object. Since our rock bounced off the sidewalk often, we decided to make a rule that you rhymed with the first square the rock touched. To “win” the game we played until we landed on all of the individual squares and had a chance to create rhyming words for each of the objects. 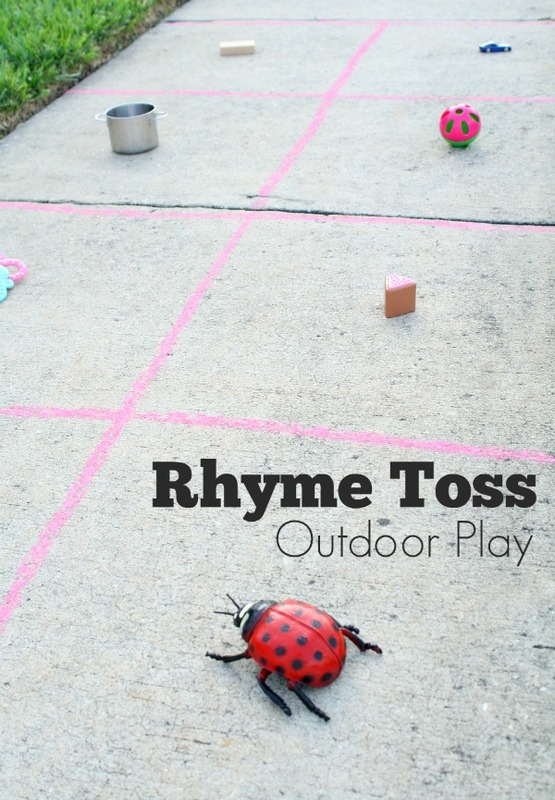 I love this activity idea to help kids think up rhyming words and keep physically fit at the same time.Will be pinning this one! 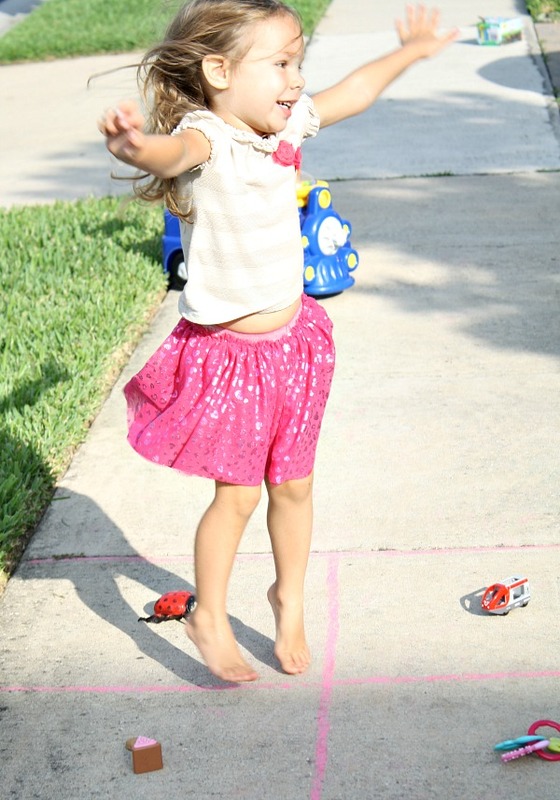 This is a great way to work on gross motor skills and have lots of fun! 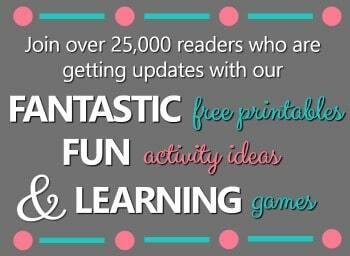 Thanks for linking up such a great idea over at The Thoughtful Spot! Love this fun idea! Going to pin it!